HOUSTON, Sept. 2, 2017 /PRNewswire/ -- LyondellBasell (NYSE: LYB), one of the world's largest plastics, chemicals and refining companies, today announced that the company's Houston Refinery donated approximately $16,000 in food to The Bridge Over Troubled Waters (TBOTW), a nonprofit family crisis center located in Pasadena near the refinery. The donation helped restock the organization's food shelves and feed more than 160 families, some of which were impacted by Hurricane Harvey. The families rely on TBOTW for shelter services and other support. 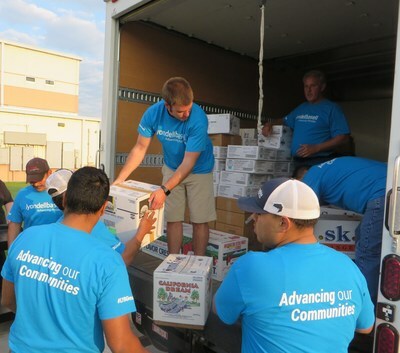 "So many families have been impacted by the storm and need basic necessities," said Jerome Mauvigney, site manager of LyondellBasell's Houston Refinery. "As these families look to recover, we are here to help ease some their burden." TBOTW offers support to provide safety and prevent domestic and sexual violence. With two offices, one in Pasadena and one in Baytown, the organization provides services such as case management, crisis intervention, a 24-hour hotline, domestic violence and sexual assault prevention education, emergency shelter and transitional living to those in Harris County.